Napa, CA – The amphitheater at The Culinary Institute of America at Copia will be named the Jackson Family Wines Amphitheater in honor of a $2 million gift from the Jackson family to the world’s premier culinary college. The outdoor venue features tiered seating for 600, or 390 with a table setup. As a premier cultural and special event space, it is expected to host thousands of people each year who are passionate about wine, food, and culinary and beverage education. Founded in 1982 by Jess Jackson and Barbara Banke, Jackson Family Wines has grown to become a distinctive wine collection rooted in extraordinary estate vineyards situated in the world’s most significant wine regions. A cornerstone of the Jackson family’s wine business is its commitment to high-quality wines made with integrity and responsible winegrowing practices. Adjacent to the Jackson Family Wines Amphitheater on the first floor of the CIA at Copia will be the new home of the Wine Hall of Fame, of which Jess Jackson is a 2009 inductee. The CIA at Copia is the ultimate Napa Valley destination for exploring, experiencing, and enjoying the world of food and wine. 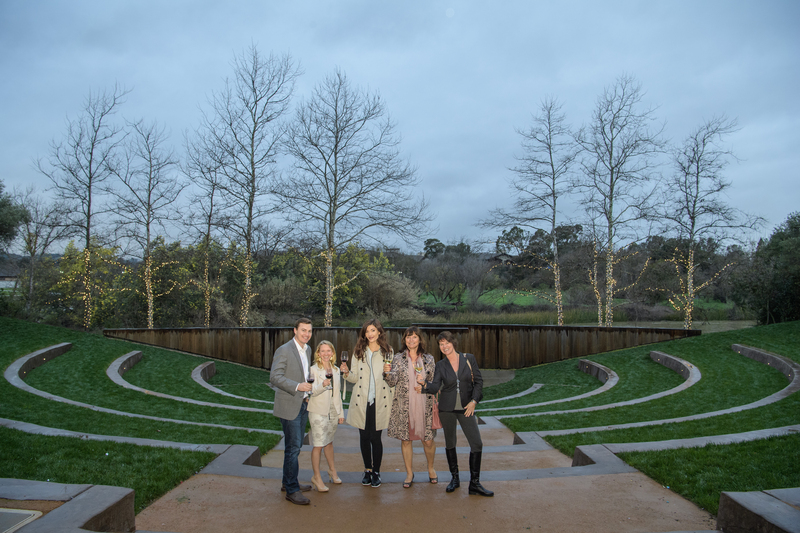 Members of the Jackson family (from left) Max Murry, Hailey Jackson Hartford, Julia Jackson, Barbara Banke, and Gilian Handleman toast the Jackson Family Wines Amphitheater at The Culinary Institute of America at Copia in Napa, CA. Jackson Family Wines is a formidable, vineyard-based company with a penchant for exploration. Founder Jess Jackson placed his faith in farming and a meticulous expression of wine with his first landscape-changing vintage in 1982, an ethos that chairman and proprietor Barbara Banke, the Jackson family and the company’s employees continue to uphold to this day. The family’s collection of 40 wineries spans significant winegrowing regions across the globe, from California, Oregon, France and Italy in the northern hemisphere, to Australia, Chile and South Africa in the southern half of the globe. Artisan winemaking underscores a steadfast commitment to making exceptional wines. In each region, vineyard ownership remains key to consistent quality, conservation and stewardship for future generations and the communities around them. Learn more at www.jacksonfamilywines.com.